Since graduating, I’ve been fortunate to gain experience working in both the mining and civil infrastructure industries. I managed to find employment in the Australian coal exploration industry during my final exams in third year. My first job was with Waratah Coal in Australia, working as an Exploration Geologist. Initially my role involved supervising drilling activities, logging and sampling the drill core recovered. I soon moved into the role of site supervisor, responsible for running day-to-day site activities for the whole project. I left Waratah Coal after a year to gain some experience in an active mining environment and to seek new challenges. 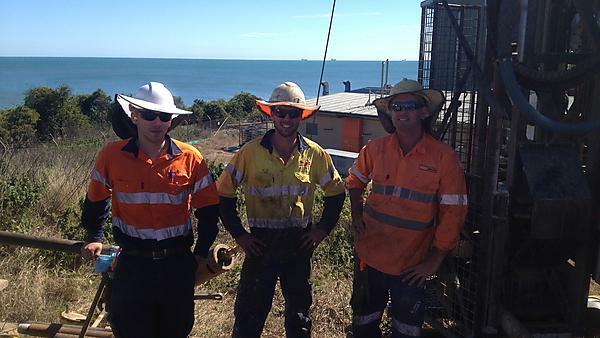 I began working with Salva Resources, a geological services contractor based in Brisbane. However, I soon realised it was not exactly what I was looking for, so began looking for work within the geotechnical industry. I was successful in getting work with Coffey Geotechnics in their flagship Queensland office in Brisbane. The geotechnics division has a good reputation within Australia and has been involved with many large, technically challenging infrastructure projects. I was brought in as an Engineering Geologist and worked on a variety of projects for both the civil and resources industry. I’ve been fortunate enough to work on many technically different projects in a short space of time, ranging from generating 3D ground models for a gold mine within an extinct volcano in Papua New Guinea, to geotechnical supervision during the construction of wind farms in rural New South Wales. Engineering geology provides a wealth of different projects to work on and always provides an enjoyable challenge. The nature of the job means that I get numerous opportunities to travel and see places in the world that many people would not ordinarily visit. In doing so I’ve had met many interesting and colourful characters. I have recently managed to secure work with Structural Soils as an Engineering Geologist, while studying an MSc Engineering Geology part time at Newcastle University. My studies at Plymouth University provided me with the key geological skills and knowledge to apply to any industry for which geologists are sought. The course also taught me professional skills that are important in any career, such as good time management and interpersonal skills. I would highly recommend any prospective student to strongly consider studying geosciences at Plymouth University. The course content was excellent and delivered to a high standard by enthusiastic and knowledgeable lecturers. While I already had a keen interest in geology, it was the enthusiasm of the lecturers who delivered the course that turned this interest into a passion.